As we all know, and as I’ve mentioned before, fitness is about trial and error, finding out what work outs, diets and routines best fit your body and lifestyle so that you can maintain this on a regular basis. If there’s something I hate is when people “ramp it up” before a show, “oh now I have to drop 20 lbs etc.” and in between shows or photo shoots, they look like completely different people. I’ve been struggling to find that balance (if there is one), since I started an ‘overhaul’ on my diet and lifestyle last year. I have had to ask myself some really serious, deep questions: Can I envision myself not eating carbs more than once a week besides breakfast every day? Drinking wine only once a week, and at that, only 1-2 glasses? The answer is of course no. With my life being so entwined in food and wine, I’m probably bound to be more of a ‘yo-yo’ dieter, but after my last show, also determined not to gain more than 3-4 lbs from when I’m on stage. Simply because I love the way it feels to look ripped more than I love that glass of wine. That being said, I’m not going to give up enjoying my wine and my foods. I still think I can have it all. Right now, there are some pounds of fat on my body I’ll need to shed before my October show, but I’m slowly getting to where I need to be and where I can actually maintain a diet and daily routine where it is indeed possible to look very fit and in great shape every day. This takes practice, experience, going through ups and downs, witnessing what works and what doesn’t. Sometimes it’s not very fun and I beat myself up a lot when I make a “mistake” but how else am I going to find out how to successfully manage my body in a way I want to? So in the realm of trying out new things, I’ve enlisted help of yet another fitness pro, IFFB Pro and Miss Olympia winner, Erin Stern, who has given me a plan for my meals, work outs and cardio. They are not radically different from the Fighter Diet at all, she just incorporates a bit more carbs through the day (except at night time/dinner, when there’s protein and veggies only). I eat smaller meals, more frequently, which gives me the illusion that I’m eating more, when in fact I’m not. I want to see how this, if at all, is going to change my body composition. It has given me a bit more energy already, and I feel like my body is tightening up but I also get more of a “sweet tooth” from eating more carbs. So we’ll see – I’m going to test this out for a month and see what happens. Erin is definitely one I can identify with – she is an athlete (believe it or not, I used to be also as a former gymnast and volleyball player), and is tall like me (we’re only 2 inches apart, her at 5’8″ and I’m 5’10”) and she has a very positive nature which I like. We all know Pauline Nordin is the guru of all gurus to me, and a personal friend, and that won’t change – but I see nothing wrong with experimenting and checking out different methods just to shape and form my own opinion of what works best for me. 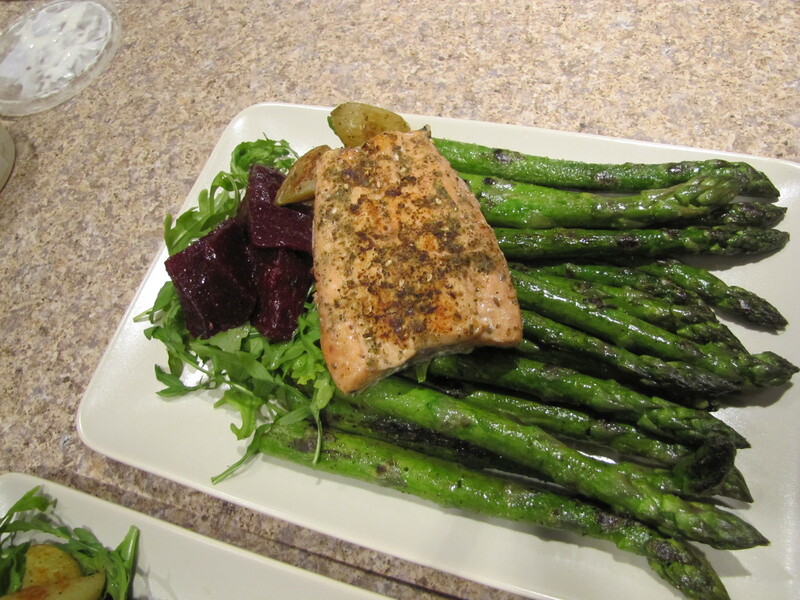 With that – I’m attaching a photo of my dinner last night… Hadn’t had salmon in a long time, and asparagus are in season right now, and they are just SO damn tasty! Get them at a farmer’s market near you now!! Elsker asparagus. Even got them to bring the white ones from Bavaria…. and they were deadly good.